The US mental health system faces considerable challenges in delivering behavioral healthcare to populations in need. In a special supplement to the American Journal of Preventive Medicine, experts focus on the key issue of behavioral health human resources for which substantial investment is needed to effect change. Articles in this issue cover research on workforce planning, service delivery and practice, and workforce preparation, and advocate for intelligent allocation of resources to ensure all clients have access to behavioral healthcare. More than 44 million American adults have a diagnosable mental health condition, and rates of severe depression are worsening among young people. Mental health and disability are well-established drivers of substance use, and drug overdose deaths fueled by opioid misuse have more than tripled from 1999 to 2016. A 2016 report by the Health Resources and Services Administration (HRSA) on the projected supply and demand for behavioral health practitioners through 2025 indicated significant shortages of psychiatrists, psychologists, social workers, mental health counselors, and marriage and family therapists. The magnitude of provider shortages, however, is not the only issue when considering access to behavioral health services. Another major concern is maldistribution, since parts of the US have few or no behavioral health providers available, and access to mental health services is especially critical in areas of poverty. A contribution from C. Holly A. Andrilla, MS, and colleagues from the WWAMI Rural Health Research Center, Department of Family Medicine, University of Washington School of Medicine, Seattle, WA, USA, summarizes the supply challenges of the behavioral health workforce, including severe shortages in rural areas. Using National Plan and Provider Enumeration System National Provider Identifier data, researchers examined the supply of psychiatrists, psychologists, and psychiatric nurse practitioners across the US. Providers were classified into three geographic categories based on their practicing county (metropolitan, micropolitan, and non-core). US population data were used to calculate provider-to-population ratios for each provider type. Psychiatrists in rural US counties per 100,000 population by Census Division. Results revealed substantial variations across Census Divisions in the supply of psychiatrists, psychologists, and psychiatric nurse practitioners and showed that rural populations have far less access to behavioral health providers than populations in the cities. The New England Census Division had the highest supply, and the West South Central Census Division had among the lowest supply of all three provider types. There was a more than tenfold difference in the percentage of counties lacking a psychiatrist between the New England Census Division (6 percent) and the West North Central Census Division (69 percent). Disparities in access to behavioral health services are particularly significant in New Mexico, where 56 percent of adults with mental illness receive no treatment, according to Deborah B. Altschul, PhD, from the Division of Community Behavioral Health, Department of Psychiatry and Behavioral Sciences, the University of New Mexico Health Sciences Center, Albuquerque, NM, USA. Dr. Altschul and colleagues focus on legislation enacted in New Mexico in 2011 to survey all healthcare professionals systematically in an effort to inform policies to address shortage issues. In 2015, almost 4,500 behavioral health providers completed a survey as a mandatory component of license renewal. Findings indicated a dearth of licensed behavioral health providers representative of the populations served, limited access to services via Medicaid and Medicare payer sources, limited access to providers working in public health settings, and limited access to health information technology. Medicaid is the single largest payer for mental health services in the US and increasingly plays a significant role in the reimbursement of substance use disorder services. Therefore, the finding that more than a quarter of providers surveyed did not have a single Medicaid patient enrolled in services was alarming. Based on this survey, researchers recommend effective recruitment and retention of professionals representative of the populations served, policy reforms to enhance the training environment and reduce unnecessary barriers to practice, post-licensure programs to encourage students from diverse backgrounds to participate in training opportunities in areas of high need, and increasing access to supervision for clinicians working in rural and underserved communities. They highlight telehealth as an innovative strategy for quickly expanding access to supervision and propose permitting interdisciplinary supervision from a variety of behavioral health professionals to increase access. Medicaid is examining reimbursement for services provided by trainees under the oversight of an independently licensed Medicaid provider. Individuals who work in a variety of settings, including psychiatric hospitals, clinics, jails and prisons, and supportive housing, and have lived experience, are increasingly employed to support those who are recovering from mental illness or substance use disorders. Susan A. Chapman, PhD, MPH, RN, of the Healthforce Center, University of California, San Francisco, CA, USA, and colleagues report on emerging roles for peer providers in supporting clients’ long-term recovery. Researchers conducted three- to five-day site visits in four states that have developed innovative peer support roles, including Pennsylvania’s program in which peer providers support those in re-entry programs from county jails; Arizona’s peer provider program working with tribal organizations and on reservations; and in peer organizations in Georgia and Texas. Data collection included document review and interviews with state policymakers, directors of training and certification bodies, peer providers, and other staff in mental health and substance use treatment and recovery organizations. They found that a favorable policy environment along with individual champions and consumer advocacy organizations were positively associated with robust programs. Medicaid billing for peer services was an essential source of revenue in both Medicaid expansion and non-expansion states. States’ peer provider training and certification requirements varied. “While peers often face stigma, low wages, and unsustainable employment, they are consistently valued by the organizations in which they work,” comments Dr. Chapman. “They are uniquely positioned to prevent acute crises and support long-term recovery, especially for clients in underserved populations and rural areas. We need greater awareness of peer providers, in addition to standards for training and certification, billing and reimbursement, so that the role can be more widely adopted in states that are further behind the ones we studied. We must remove the policy barriers that prevent peer providers from helping the people who need it most. An article by Rebecca L. Haffajee, JD, PhD, MPH, and colleagues from the University of Michigan highlights some of the policy considerations important in trying to address the opioid crisis workforce and overcoming barriers to the provision of buprenorphine, a highly effective medication-assisted treatment for opioid use disorders. 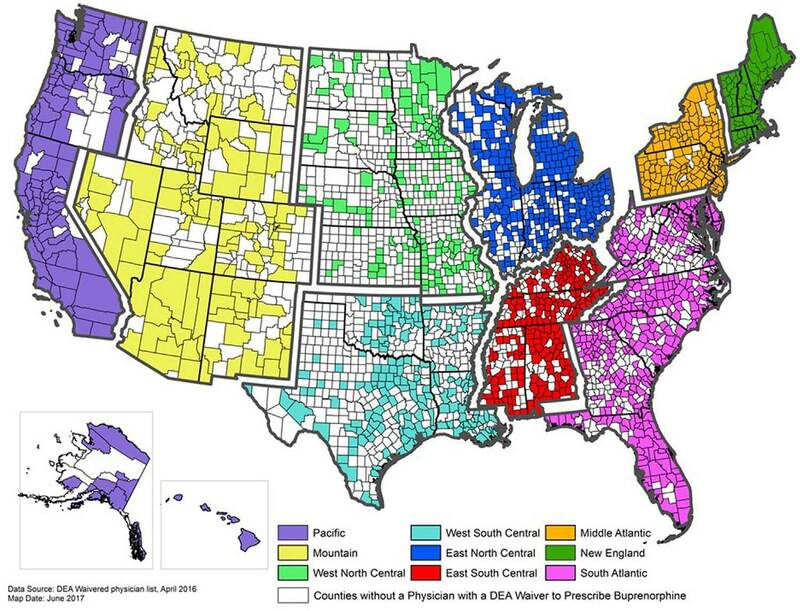 US counties with at least one physician with a Drug Enforcement Administration waiver to prescribe buprenorphine for opioid use disorder, by US Census Division (from “Prescribing Practices of Rural Physicians Waivered to Prescribe Buprenorphine,” by CHA Andrilla, C Coulthard, DG Patterson). Dr. Haffajee and colleagues propose specific policies to address workforce barriers in several domains such as insufficient training and experience; lack of institutional and peer support; poor care coordination; stigma; and burdensome reimbursement and regulatory procedures. Significant recommendations include eliminating the national waiver process for qualified buprenorphine prescribers, replacing it instead with robust training from graduate education throughout practice. They also recommend incentives for providers to regularly prescribe buprenorphine, especially in rural areas of high need, such as loan repayment programs. Finally, they suggest that reimbursement models adjust to comprehensively cover buprenorphine and related treatment. The 2016 HRSA report projected that the supply of workers in selected behavioral health professions would be some 250,000 workers short of the projected demand by 2025. These shortages, along with the maldistribution of behavioral health providers, further complicate the behavioral health landscape by limiting access to essential care and treatment for millions of individuals with mental illness or substance use disorders. Articles appear in the American Journal of Preventive Medicine, volume 54, issue 6, supplement 3 (June 2018), published by Elsevier. It will be openly available at http://www.ajpmonline.org/issue/S0749-3797(18)X0003-8. Please visit this site to view the table of contents and access full text of the contributions. Full text of the articles is available to credentialed journalists prior to the embargo date; contact Jillian B. Morgan at +1 734 936 1590 or ajpmmedia@elsevier.com. Journalists wishing to interview the Guest Editors or authors should contact Angela J. Beck at ajbeck@umich.edu. This supplement issue of the American Journal of Preventive Medicine was supported by the Substance Abuse and Mental Health Services Administration (SAMHSA) and the Health Resources and Services Administration (HRSA) of the US Department of Health and Human Services (HHS) under U81HP29300-03-02, Behavioral Health Workforce Research Center. This information or content and conclusions are those of the authors and should not be construed as the official position or policy of, nor should any endorsements be inferred by SAMHSA, HRSA, HHS, or the US Government.